A Christening, also known as Baptism, is the start of an amazing journey of faith for your child and a special day for all your family and friends to celebrate. If you are thinking of having your child Christening then we would love to hear from you! At St Michael and St Mary Magdalene, Christenings normally take place on the 1st Sunday of every month at 11:30am and 12:30am. We are a popular Church for Christenings and get booked-up very quickly. To book a Christening at our Church, you will need to come along to the Parish Office on either a Tuesday 3:30-4:30pm or Wednesday 6:00-7:30pm. You don't need an appointment, just turn-up and a member of the Clergy will see you. They will ask you questions to see if you are able to have your child Christened at this Church. You will be given a Christening Pack to take away and forms to return if you wish to proceed. How do I Book a Christening? After your first meeting you will need to return the completed application Form to the Clergy in Parish Office when it is open on a Tuesday or Wednesday. When do the Christening Services take Place? Baptism Services usually take place at 11.30am and 12.30pm on the first Sunday of the month. What if I've not been Christened? Can I still have my child Christened? Yes. You do not need to be Christened yourself to have your child Christened. It is essential however that all Godparents have themselves been Christened (Baptized). Godparents are really important and choosing who you're going to ask to be Godparent is a big decision. Becoming a Godparent is a life-long commitment and on the day of your child's Christening they are going to make some big promises on your child's behalf. We ask you to bear in mind that Godparents are not just there to look after the child should something happen to you. The role of a Godparent is to pray for your child, to model and encourage them to develop Christian values and to help them learn more about the Christian faith as they grow up. Remember that Parents can also be Godparents. If there are any problems choosing the Godparents the Clergy are happy to talk it through with you. Can my older children be Christened? For many reasons, sometimes older children or even their parents, haven't been Christened. Anyone can be Christened at any age, from being just born to 150! Often with older children and adults, we ask that they be confirmed as well. Ask the Clergy for details and guidance. Can we Photograph and Video the Service? We don't allow photos or videos during the service for safeguarding reasons. This is because several family groups are present at each christening. 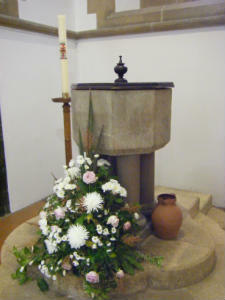 However you are welcome to pose at the font, or at the front, and take photos of your family group after the service. The clergy will be glad to pose for photos with you if you ask. Help! My Children are noisy! We have bags available with picture books, soft toys and all kinds of things to keep young children happy. Ask the Sides person at the back of Church for one. We find the only problem is getting the children to give them back! Are there Toilets in the Church? There is a toilet in the Annex attached to the Church. It is also suitable for disabled people to use. The Annex is also a good place for Baby Changing or Toddler Tantrums!